Like any city, Auckland is the product of a mix of historical accidents, perverse consequences, failed dreams, and unfinished visions. Some plans succeed (often with unexpected results), while others fail, leaving nothing behind but some maps and occasionally a few hulking piles of cement. The maps that are left behind can tell us something about a city’s past, present, and future. So here are four maps of Auckland’s transport networks – one as it was, one as it has become, one of a failed vision for change, and one that is, with a bit of luck, en route to realisation. 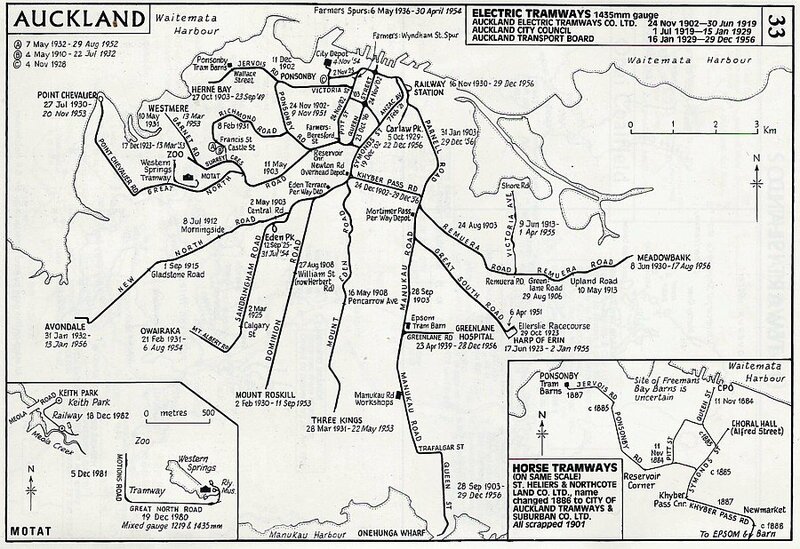 Auckland as it was: The electric tramways that were unceremoniously ripped out in 1956. This is the Auckland of my grandparents’ youth. This map’s legacy still haunts the isthmus – it can be discerned in the frequent bus network, in the spacing of shops along arterial roads, and in the width of certain streets. 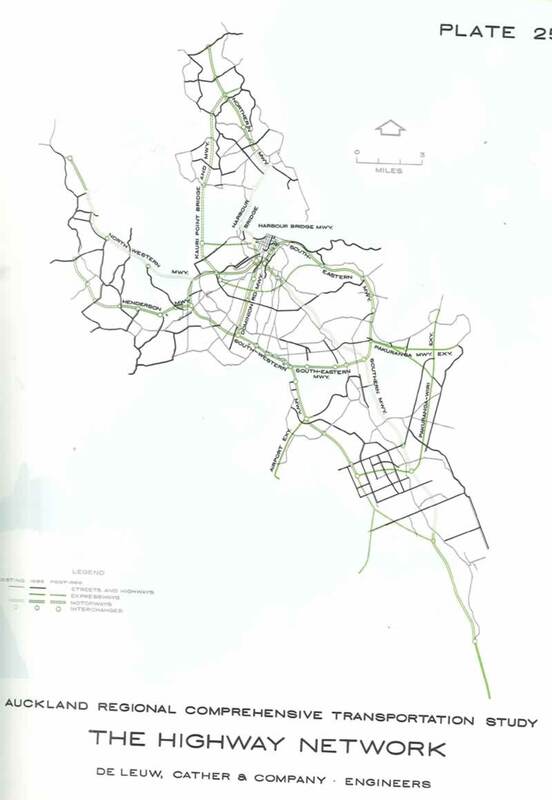 Auckland as it has become: The 1956 De Leuw Cather plan setting out the future shape of the city’s motorways. It is due for completion in a few years’ time, when the Waterview tunnel borer finishes its work. This map has shaped virtually every major transport project of the past 60 years. Perhaps it is time for a different vision of the future? 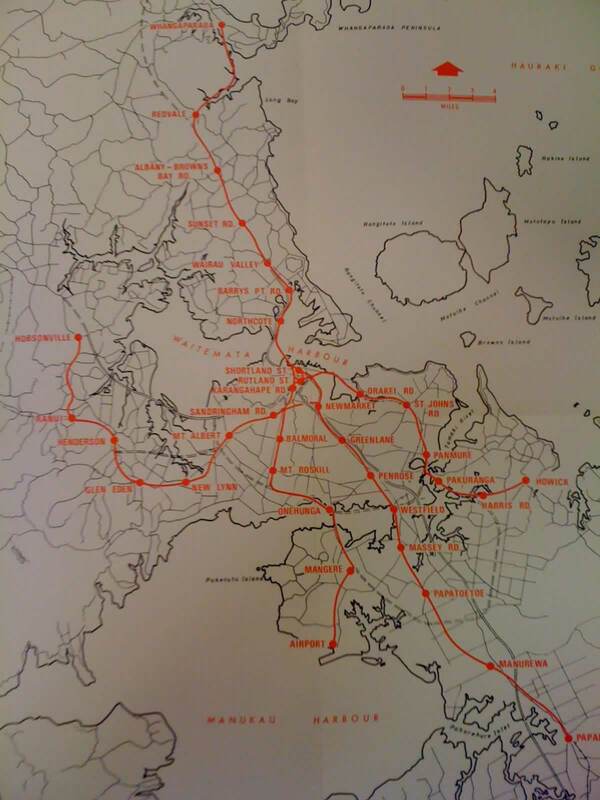 Auckland as it never was: Dove-Meyer Robinson’s 1972 “rapid rail” plan. Its unfulfilled aspiration of a working public transport network has enjoyed a renaissance in recent years with the completion of the Northern Busway, a New Zealand first, the development of Britomart and the electrification of the rail network. But the heart of the network – the City Rail Link – sometimes seems no closer than it did in the Muldoon years. 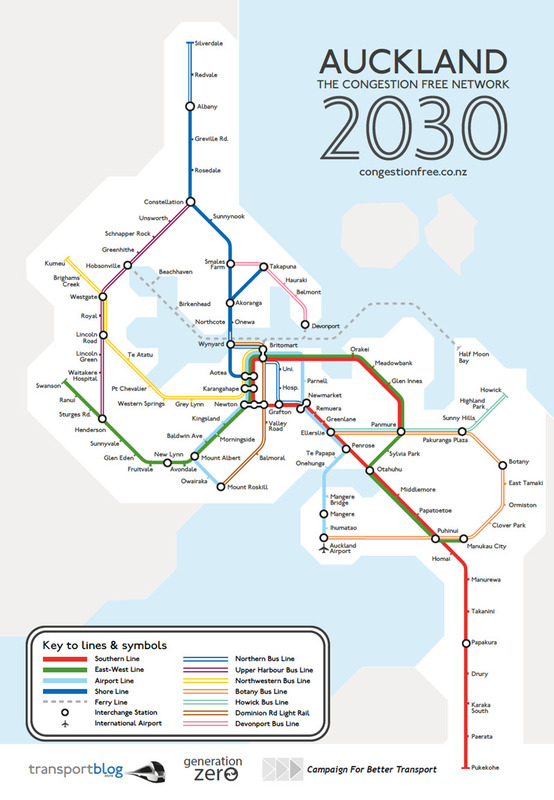 Auckland as it could become: Auckland’s transport maps got a futuristic addition last year – the Congestion Free Network. The map, which is based on the famous London tube map, envisages a future Auckland that’s connected not just by roads but by a rapid-transit network. In keeping with New Zealand’s DIY values, it’s not a rail network alone, but a mongrel mix of light rail, busways, and even ferries grafted onto the existing (and to-be-extended) commuter rail network. These maps are not descriptions of real (or longed-for) transport networks. They are interventions in how we see Auckland. Each map recasts our scale of Auckland – notice the way that the later maps zoom out from the isthmus, bringing more and more territory into the city and defining new edges for it. As the city grows, so too must the transport maps. Or did the expansion of the maps cause the growth of the city? The maps offer very different levels of detail about the places that are connected by transport networks. The tramline map offers easily-readable details on the urban fabric – street and suburb names, major destinations, etc. The motorway map is incredibly spare by comparison – it omits place names in favour of a series of connecting lines. Major motorways are named, but all of the other details of Auckland are lost. This is interestingly suggestive of the priority that these types of transport systems place on movement versus place. And, of course, these maps increasingly situate Auckland within globalised ideas about cities. The motorway map was, of course, prepared by an American consultancy in accordance with the antiquated fad for urban freeways. But the CFN map might accomplish an even more radical shift in perceptions. By emulating the famous tube maps down to the fonts and colour scheme, the CFN makes Auckland instantly recognisable by residents of other cities with similar maps – from London to Sydney to Amsterdam. Auckland: another aspirational global city in a globalised world? Given the choice, which Auckland would you prefer to live in? I had never previously noticed that the Dom Rd / Airport Line is very close to one of the lines shown on the 1972 map. Shows it’s probably the right route. and once light rail and ameti are done almost all of Robbie’s original rail routes will have some form of rapid transit on them. Except the western line. It would be a stretch to call that train rapid. Why is the Western Line so slow? Close spacing of stations, multiple level crossings(which slow the trains automatically on the ETCS) and curves on the line as it winds around local geographic features. Kauri point bridge is interesting. It’d provide a counterflow alternative to Onewa Rd and the harbour bridge. Rail extension from panmure to Howick. Dominion Rd motorway was to be parallel to the road. I think the disruption from constructing rail down Dom Rd will be too great. Either a lot of buildings will need to be demolished or put it underground, similar to the cut & over method used for the MRT through Chinatown in Singapore where the road was kept open through the use of a moveable bridge over the construction zone. Having a new water main go up my street, I’m not sure that C&C with a moving bridge will be built all that fast in NZ. Getting rid of the car parking and putting the rail down the centre is not that disruptive. Putting bus lanes in place of that car parking now. I’ve been suggesting starting the LRT from the Onehunga. I think it would be less disruptive. Especially if you lose PT capacity on Dominion Road and this allows you to feed into the existing network via an alternative route. LRT to HRT at Onehunga. +1, we will also need to massively boost services on Sandringham and Mt Eden Roads to make up for lost capacity here. Robbies plan.. lets make that! I think the map from the 1946 Auckland Plan would be a great addition to this post. I want the Auckland with the flying jet packs. I was promised we would have them by 2020. I want my jet pack gosh darn it! The problem with jetpacks is they’ll potentially make it more viable to live on the outskirts, so whereas we should be able to tax them heavily on the basis they create 3-dimensional congestion, a new noise pollution source and are fuel-inefficient, there will be equity concerns about doing so. They’ll essentially allow us to continue as NIMBY’s allowing no intensification and to pretend that this is ok because the poor have jetpacks. Except that the rich will have jetpacks too, and we’ll essentially be ruining our city. But AT will subsidise 60 seater jetpacks for those too young or too poor to fly their own jetpack. The subsidised ones will operate with 30 minute frequencies at peak times, every three hours during the day and once a day at weekends. You will be expected to walk 20 minutes at each end of the flight and stand in the rain, and you will be charged $2000 if you forget to tag off. That’s OK then. And once the numbers start requiring 3D laneways, will you set up the AJT 3D model to analyse it? I will probably focus on the minimum jetpack storage rules for developments and doing plans for on-street jetpack landing. There should be plenty of space if we get rid of those old cycle lanes. I’m sure it’ll be nice going to bed knowing you’ve contributed to the greater good. I’ll probably conduct research into polycultures of plants that can cope with the new cocktail of chemical drift, and in my spare time campaign to change the designation of spaces like community gardens and food forests to be landing-free. Yeah, definitely need public jet pack landing sites. Loud noises scare my dog , so it is essential that council provides somewhere right next to my property so I can land.